Van Kooten en De Bie were a Dutch comedy duo formed by Kees van Kooten and Wim de Bie. They started performing together in 1964. They started off as radio comedians, but gained more prominence from 1966 on by working for television. 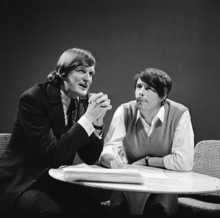 In 1974 they began a weekly TV sketch show on Sunday evenings, "Het Simplisties Verbond", broadcast on VPRO, which continued for three decades under various titles, while remaining the same concept, until finally coming to a close in 1998. 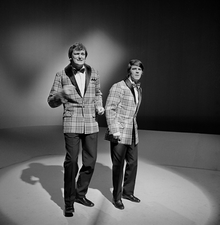 Despite the varying titles of their TV show the general audience always referred to them as Van Kooten en De Bie. In the Dutch-speaking world Van Kooten en De Bie enjoy both a high popularity and critical acclaim for their satirical portrayal of society, with numerous classic sketches and comedy characters. They also created many musical singles, audio plays, calendars and books. The two cooperated for years, before they started to work for the public broadcasting organization VPRO, where they first performed for radio broadcasting, and later took to making shows for television. Their first television appearance was in 1972 with the program Het Simplisties Verbond (The Simplistik [sic] League), with a carpet-beater as their symbol. The show mainly featured sketches whose returning intricate characters and running gags quickly became very well known in The Netherlands. In 1980 they changed the name of their weekly programme to Koot en Bie, a year later renamed Van Kooten en De Bie. In 1989 the show took a turn to focus more on current events, and was therefore renamed Keek op de week (View on the Week). In 1998 the duo finally decided to end their TV career. Their final TV-appearance as "Koot en Bie", took place on 16 November 2003 in the VPRO-program Terugkeek van Van Kooten en De Bie'. Van Kooten and De Bie were praised for their satirical and socially conscious view of Dutch society and politics. Over the course of three decades their TV show broadcast a new episode every Sunday evening. They played a host of recurring comedy characters, but also imitated well known Dutch politicians and entertainers. Most of the sketches were played only by themselves, with occasional extra's and side characters. Apart from their TV shows Van Kooten en De Bie also made books, calendars, musical singles and audio plays. From the 1970s until the 1990s they were household names in the Dutch-speaking world, drawing in many viewers from Flanders as well. They were a major influence on many Dutch and Flemish satirical sketch shows, including Koefnoen, Kopspijkers, 30 minuten, Draadstaal and In de gloria. Their influence on Dutch society is such that they inspired many neologisms, which entered the daily language and have been added to the dictionary. A 2003 study attributed at least 40 words and expressions to them, with 10 others they popularised. They won two Zilveren Nipkowschijf awards, one in 1974 and one in 1977. In 1985 they received a honorary Nipkow schijf. Their popularity is reflected in their 30th place in a 2004 public poll to search the all-time "greatest Dutchman". They were the highest television personalities on the list and as comedians were only preceded by cabaretier Toon Hermans at 22. ^ a b c d "Simpelsite - Van Kooten & De Bie homepage". Wikimedia Commons has media related to Van Kooten & De Bie.